I run a free email list and wanted to share one of the recent messages I sent out. I hope it gives you some food for thought. There are over 400 guitarists subscribed to the list and they're all keen on deepening their understanding of music, discovering rare resources and opening up new possibilities. I love learning how musicians from past centuries - like Sor, Aguado, Mertz, Tarrega, etc. - thought about music. Something I've come to realize is that how the old masters thought and learned is not taught today. Why wouldn't we learn like the old masters did?!?! 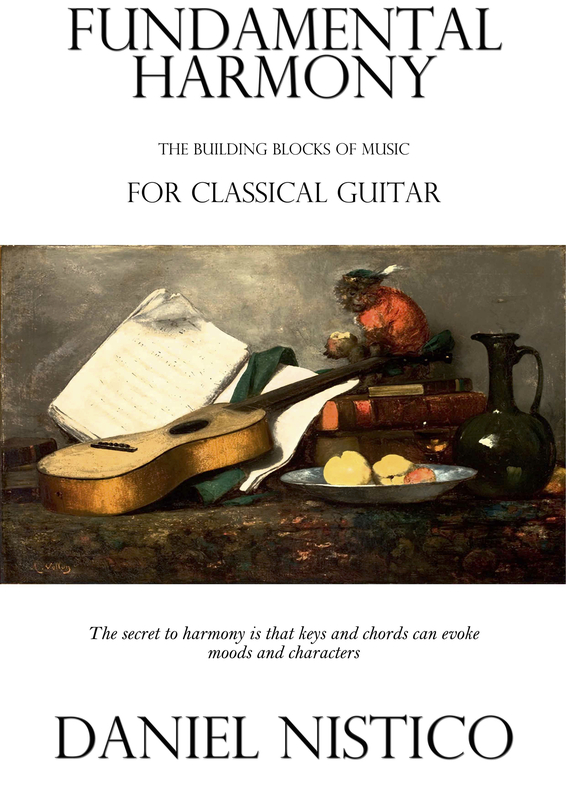 - Practiced the building blocks of music such as triads, cadences, etc. Do you find any of this in classical guitar books today? Something changed during the 21st century... books now lean much more towards the mechanics of playing guitar, but often neglect all those topics listed above. Each topic is a can of worms in itself, so today I just want to focus on the first and last. These are addressed in my eBook, Fundamental Harmony. Triads are one of music's most important building blocks and are found everywhere in pieces. If you practice them on a daily basis, then you will greatly improve your musical fluency - you'll read, learn and understand music faster. Identifying and playing triads will become second nature for you. The ROTO is essentially a harmonized scale. Each note of the scale is harmonized to teach you the laws of common practice harmony, so the result is that they sound pleasing in general. Practicing such a progression helps you internalize the laws of harmony, such as how certain chords resolve to others. Fundamental Harmony is the first ever book since the 1800s to have the ROTO contained in it. On a technical level, you can get both of your hands fired up by adding right hand arpeggios to the chords. In the past, musicians associated keys with specific emotions. Think of some pieces you're playing that are in C Major. Do you feel the moods and characters listed above portrayed in those pieces? Take a listen to the first three etudes by Leonard Schulz, which are all in C Major. Do they portray the emotions above? And what if a piece changes from one key to another? It's not just for the sake of changing the sharps and flats you play - it's so much deeper than that! Composers change keys to provide contrasting moods and emotions to the music. So that gives us some powerful information to use in our playing, even if a simple piece like the one below. Grab your guitar and have a play through the example below. Now you know the true power of understanding harmony and how it portrays different emotions. This can help you make drastic changes to your playing. You can shift your mindset from "what do my fingers need to do" to "what emotion is the music portraying". This gives a totally different effect to the listener and makes the music more enjoyable for you to play. You'll shift from left brain mode to right brain mode, giving your playing a totally different flow and engagement. Even if there are some technical errors, you'll play with such convincing expression that no one will care about the mistakes. If you want to delve deeper into these secrets of old, then check out my eBook, Fundamental Harmony. It contains exercises and pieces in all common guitar keys. Playing the pieces with the quotes in front of you will help to paint the emotional picture of the piece. This can then be applied to other pieces you're playing too. Click below to learn more about my eBook, which is only available until December 31st. Last edited by Daniel Nistico on Fri Nov 16, 2018 1:25 am, edited 1 time in total. But this post doesn't exactly get to a point implied in the topic does it? Or are there four things? Congratulations on the writing of the book. Good luck. This has captured my interest. Thanks for your generous offer. I hope to make some good use of it. Steve - I appreciate your comment and realize that my article is a little confusing in relation to the title. The point I was really trying to highlight was the bit about harmony and emotion. I will edit the post and take this into account. Thanks for pointing this out - it really helps my writing! I would be interested in the descriptive emotions people have labeled all 24 different keys with, along with the quotes' sources. Along with modes, and scales using semi tones, people have been defining flavors of each sound going way back. Thank you for your work! That kind of specificity made sense at a time when the keys were really different due to unequal temperament systems. Since the adoption of 12-tone equal temperament, this is not anymore the case. 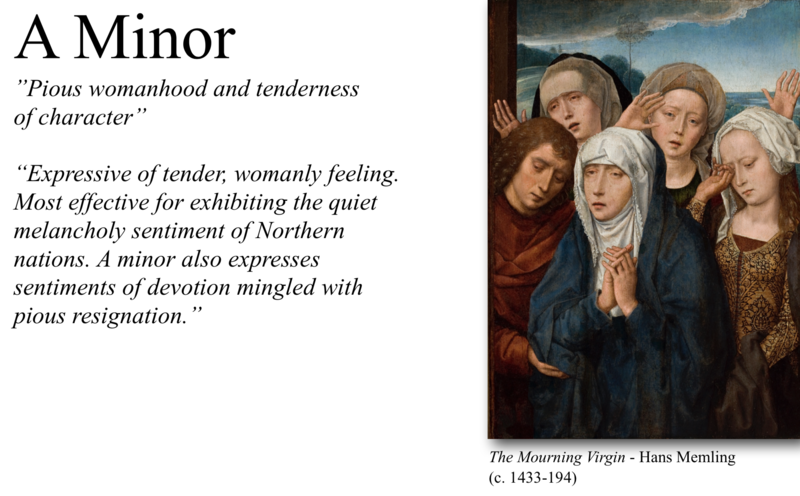 We are, of course, still left with the major and minor modes, which are normally associated with joyfulness and sadness (and synonyms), respectively; as well as the emotional content of the music itself, as Daniel probably describes in his book. Last edited by guitarrista on Tue Nov 20, 2018 7:36 pm, edited 1 time in total. Actually... nicely put together, but none of this is secret stuff, broadly speaking; any music history book will reveal it. Do you also go into the realm of musical rhetoric, which was employed well into the Baroque era? I just bought this book and what you see here is a good example of what is in it. The book is the same idea as shown, done for 17 keys. It looks simple but when you realize what you can do with it it is really brilliant. Judging by the music he supplies with each key, the book is probably meant for more advanced players than myself. I am at a beginner (grade 2) level but, though I am not yet ready for the music supplied with each key, the playing of triads has already helped me with some concepts I have been deleting from my brain for years Reading music theory is deadly to me and never sticks, but somehow playing and saying these triads just put everything into perspective. I’m pretty sure, as my music knowledge and abilities grow, I will find this book more and more useful. I think it is not a “how to” book but something that can be used creatively to enhance whatever level you are. I thank you, Daniel, as this book comes at a very opportune time in my cg journey. Every time I see this thread listed among the many out of the corner of my eye I think it says, "Something About Mary." What makes me really sick is that I was dumb enough to click on a couple, and both were full of cr@p.
Clearly the OP here never studied music with either me or my harmony teacher, Anna Butterworth. Every lesson was about emotion and feeling. That is what harmony is all about. Thank you so much for your wonderful comments about how my book is useful for you. It's very helpful for me to receive comments like that! Harmony is everything. This post is helping me internalize thoughts and feelings I had over the years, but couldn't quite get a handle on. The subject of ROTO is worthy of it's on thread. Thanks Daniel. I got onto Daniel’s email list when I signed up for his Daily Practice Routine. The amount of info he is sharing is incredible. I wish I was advanced enough to take better advantage of some of it. He has more info on how to use ROTO, with suggestions. Rob may not like Daniel’s marketing approach but Daniel has a lot of interesting ideas for the more advanced guitarists. There is lots of stuff on the Web for beginners like me, but it must be hard to find new learning ideas when you have gone beyond “how to play a rest stroke”.